تصور فني، منشور في إندياتوداي، 4 ديسمبر 2017. چاندرايان-2 (Chandrayaan-2 ؛ بالسنسكريتية: चन्द्रयान-२; سنسكريتية: [ t͡ʃʌnd̪ɾʌjaːn d̪ʋi]؛ حرفياً: مركبة القمر وتُنطق (المساعدة·معلومات)) هي ثاني مهمة هندية لاستكشاف القمر بعد چاندرايان-1. طوّرتها هيئة أبحاث الفضاء الهندية (ISRO)، والمهمة مُزمعة للإطلاق إلى القمر بواسطة مركبة إطلاق السواتل أرضية التزامن مارك 3 (GSLV Mk III). وتضم مركبة مدارية قمرية ومركبة إنزال و جوال، كلهم طورتهم الهند. چاندرايان-2 يُزمع أن تنطلق ليس قبل يناير 2019، وستحاول أن تُنزل برفق مركبة إنزال وجوال في سهل مرتفع بين فوهتين، مانزينوس C و سمپليوس N، عند خط العرض حوالي 70° جنوب. ولو نجحت، فستكون چاندرايان-2 أول مهمة على الإطلاق تـُنزِل جوالاً بالقرب من القطب الجنوبي القمري. وحسب ISRO، فهذه المهمة ستستخدم وتختبر عدداً من التقنيات الجديدة وتجري تجارب حديثة. الجوال ذو العجلات سيتحرك على سطح القمر وسوف يقوم بتحاليل كيميائية في الموقع. البيانات سوف تُبث إلى الأرض عبر المركبة المدارية لچاندرايان-2، التي ستكون محمولة في نفس الإطلاق. في 12 نوفمبر 2007، وقـّع ممثلو وكالة الفضاء الاتحادية الروسية (روس‌كوزموس) مع ISRO اتفاقية لتعاون الوكالتين في مشروع چاندرايان-2. على أن يكون لإسرو المسئولية الرئيسية للمركبة المدارية والجوال، بينما روس‌كوزموس سوف تورّد مركبة الإنزال. وافقت الحكومة الهندية على المهمة في اجتماع مجلس الوزراء، الذي انعقد في 18 سبتمبر 2008 وترأسه رئيس الوزراء مانموهان سنغ. اكتمل تصميم المركبة الفضائية في أغسطس 2009، بإجراء علماء البلدين مراجعة مشتركة. وبالرغم من أن إسرو أنهت الحمولة لچاندرايان-2 حسب الجدول المقرر، فإن المهمة تأجلت في يناير 2013 إلى 2016 لعدم قدرة روسيا على تطوير مركبة الإنزال في الوقت المطلوب. ولاحقاً اسنحبت روس‌كوزموس عقب فشل مهمة فوبوس-گرونت إلى المريخ، والسبب المعلن كان أن النواحي التقنية المتعلقة بمهمة فوبوس-گرونت كانوا أيضاً مستخدَمين في المشاريع القمرية، مما يتطلب المراجعة. وفي حينها ذكرت روسيا عدم قدرتها على تسليم مركبة الإنزال حتى في 2015، فقررت الهند تطوير المهمة القمرية بنفسها بشكل مستقل. إطلاق المركبة الفضائية كان مزمعاً في مارس 2018، ثم تم تأخيره إلى أبريل ثم أكتوبر لإجراء المزيد من الاختبارات على المركبة. وفي 19 يونيو 2018، بعد رابع اجتماع للمراجعة التقنية الشاملة للبرنامج، تم التخطيط لتنفيذ عدد من التغييرات في النسق وترتيب الإنزال، مما دفع موعد الإطلاق للتأخير إلى ما بعد 3 يناير 2019. المركبة المدارية ومركبة الإنزال في وضع التكديس مع الجوال داخل مركبة الإنزال. المهمة مزمعة للانطلاق على متن مركبة إطلاق السواتل أرضية التزامن مارك 3 (GSLV Mk III) بكتلة انطلاق تناهز 3,890 كيلوجرام من مركز ساتش دوان الفضائي في جزيرة سري‌هاري‌كوتا. اعتبارا من فبراير 2018[تحديث]، بلغت تكلفة المهمة 800 كرورى (أي نحو 125 مليون دولار). المركبة المدارية سوف تدور حول القمر على ارتفاع 100 كيلومتر. وستحمل المهمة خمسة أجهزة على متن المركبة المدارية. ثلاثة منهم جدد، والإثنان الآخران هما نسختان محسّنتان من أولئك اللائي حُمِلت على متن چاندرايان-1. كتلة الإطلاق التقريبية سوف تكون 2,379 كيلوجرام. الكاميرا عالية الدقة للمركبة المدارية (OHRC) ستجري أرصاداً عالية الدقة لموقع الإنزال قبل انفصال مركبة الإنزال عن المركبة المدارية. واجهات التعامل بين المركبة المدارية وصاروخ الإطلاق GSLV Mk III انتهى تطويرها. هيكل المركبة المدارية صـُنع في Hindustan Aeronautics Limited and delivered to ISRO Satellite Centre on 22 June 2015. مركبة الإنزال للمهمة مسماة ڤـِكرام، على اسم ڤـِكرام سارابهاي (1919-1971) الذي يُعتبر، على نطاق واسع، "أبو برنامج الفضاء الهندي". وسوف تنفصل مركبة الإنزال ڤـِكرام عن المركبة المدارية وتهبط إلى مدار قمري يبعد 30-100 كم من القمر باستخدام محركاتها بالوقود السائل بقدرة 800 نيوتن. It will then perform a comprehensive check of all its on-board systems before attempting to land on the lunar surface. Unlike Chandrayaan-1's Moon Impact Probe, the Vikram lander will make a soft landing, deploy the rover, and perform some scientific activities for approximately 15 days. The approximate combined mass of the lander and rover is 1,471 kg (3,243 lb). The preliminary configuration study of the lander was completed in 2013 by the Space Applications Centre (SAC) in Ahmedabad. 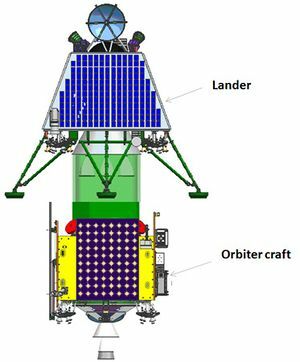 The lander's propulsion system consists of eight 50 N (11 lbf) thrusters for attitude control and five 800 N (180 lbf) liquid main engines derived from ISRO's 440 N (99 lbf) Liquid Apogee Motor. Initially, the lander design employed four main liquid engines, but a centrally mounted engine was added to handle new requirements of having to orbit the Moon before landing. The additional engine is expected to mitigate upward draft of lunar dust during the soft landing. Some associated technologies include a high resolution camera, navigation camera, hazard avoidance camera, an 800 N throttleable liquid main engine and attitude thrusters, altimeter, velocity meter, accelerometer, and the software needed to run these components. The lander's main engine has successfully undergone a high altitude test for a duration of 513 seconds, and closed loop verification tests of the sensors, actuators and software were completed in 2016. Engineering models of the lander began undergoing ground and aerial tests in late October 2016, in Challakere in the Chitradurga district of كرناتكا. ISRO created roughly 10 craters on the surface to help assess the ability of the lander's sensors to select a landing site. The rover's mass will be about 27 kg (60 lb) and will operate on solar power. The rover will move on 6 wheels on the lunar surface, perform on-site chemical analysis and send the data to the orbiter above, which will relay it to the Earth station. Stereoscopic camera-based 3D vision - will provide the ground team controlling the rovers a 3D view of the surrounding terrain. Kinematic traction control - will enable the rover to negotiate the rough lunar terrain using independent steering provided on four of its wheels. Control and motor dynamics - The rover will have six wheels, each driven by an independent electric motor. Four of the wheels will also be capable of independent steering. A total of 10 electric motors will be used for traction and steering. ISRO selected five scientific instruments for the orbiter, four for the lander, and two for the rover. While it was initially reported that NASA and ESA would participate in the mission by providing some scientific instruments for the orbiter, ISRO has later clarified that due to weight restrictions it will not be carrying foreign payloads on this mission. Large Area Soft X-ray Spectrometer (CLASS) from ISRO Satellite Centre (ISAC), Bangalore and Solar X-ray monitor (XSM) from Physical Research Laboratory (PRL), Ahmedabad for mapping major elements present on the lunar surface. L and S band Synthetic Aperture Radar (SAR) from Space Applications Centre (SAC), Ahmedabad for probing the first few tens of metres of the lunar surface for the presence of different constituents, including water ice. SAR is expected to provide further evidence confirming the presence of water ice below the shadowed regions of the Moon. Imaging IR Spectrometer (IIRS) from SAC, Ahmedabad for mapping of lunar surface over a wide wavelength range for the study of minerals, water molecules and hydroxyl present. 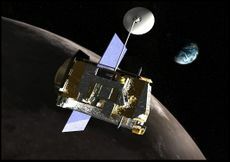 Neutral Mass Spectrometer (ChACE-2) from Space Physics Laboratory (SPL), Thiruvananthapuram to carry out a detailed study of the lunar exosphere. Terrain Mapping Camera-2 (TMC-2) from SAC, Ahmedabad for preparing a three-dimensional map essential for studying the lunar mineralogy and geology. Laser induced Breakdown Spectroscope (LIBS) from Laboratory for Electro Optic Systems (LEOS), Bangalore. Alpha Particle Induced X-ray Spectroscope (APIXS) from PRL, Ahmedabad. ^ "Chandrayaan-2: All you need to know about ISRO's first mark on the moon". الهند اليوم. 2017-12-04. ^ أ ب ت ث Nair, Avinash (31 May 2015). "ISRO to deliver "eyes and ears" of Chandrayaan-2 by 2015-end". The Indian Express. Retrieved 7 August 2016. ^ أ ب ت ث ج ح خ د "Chandrayaan-2 to Be Launched in January 2019, Says ISRO Chief". Gadgets360. NDTV. Press Trust of India. 29 August 2018. Retrieved 29 August 2018. ^ أ ب ت ث ج ح خ "ISRO to send first Indian into Space by 2022 as announced by PM, says Dr Jitendra Singh". Indian Department of Space. 28 August 2018. Retrieved 29 August 2018. ^ أ ب "Chandrayaan-2 to be launched in January-March window in 2019". Business Standard. Indo-Asian News Service. 12 August 2018. Retrieved 15 August 2018. ^ أ ب Singh, Surendra (5 August 2018). "Chandrayaan-2 launch put off: India, Israel in lunar race for 4th position". The Times of India. Times News Network. Retrieved 15 August 2018. ^ أ ب ت Shenoy, Jaideep (28 February 2016). "ISRO chief signals India's readiness for Chandrayaan II mission". The Times of India. Times News Network. Retrieved 7 August 2016. ^ أ ب ت ث ج ح خ Kiran Kumar, Aluru Seelin (August 2015). 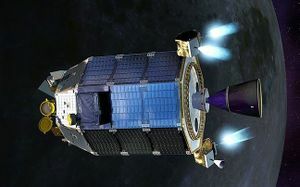 Chandrayaan-2 - India's Second Moon Mission. YouTube.com. Inter-University Centre for Astronomy and Astrophysics. Retrieved 7 August 2016. ^ "candra". Spoken Sanskrit. Retrieved 5 November 2008. ^ "yaana". Spoken Sanskrit. Retrieved 5 November 2008. ^ "ISRO begins flight integration activity for Chandrayaan-2, as scientists tests lander and rover". The Indian Express. Press Trust of India. 25 October 2017. Retrieved 21 December 2017. ^ Bagla, Pallava (4 August 2018). "India Slips In Lunar Race With Israel As Ambitious Mission Hits Delays". NDTV. Retrieved 15 August 2018. ^ Bagla, Pallava (31 January 2018). "India plans tricky and unprecedented landing near moon's south pole". Science. Retrieved 19 February 2018. ^ Mallikarjun, Y. (7 September 2007). "Chandrayaan-2 to be finalised in 6 months". The Hindu. Retrieved 22 October 2008. ^ "Chandrayaan-II will try out new ideas, technologies". The Week. 7 September 2010. Archived from the original on 14 July 2011. Retrieved 7 September 2010. ^ "Landing spots for Chandrayaan-2 identified". DNA India. 21 February 2014. Retrieved 23 February 2014. ^ Subramanian, T. S. (4 January 2007). "ISRO plans Moon rover". The Hindu. Retrieved 22 October 2008. ^ Rathinavel, T.; Singh, Jitendra (24 November 2016). "Question No. 1084: Deployment of Rover on Lunar Surface" (PDF). Rajya Sabha. ^ Chand, Manish (12 November 2007). "India, Russia to expand n-cooperation, defer Kudankulam deal". Nerve. Archived from the original on 13 January 2014. Retrieved 12 January 2014. ^ Sunderarajan, P. (19 September 2008). "Cabinet clears Chandrayaan-2". The Hindu. Retrieved 23 October 2008. ^ "ISRO completes Chandrayaan-2 design". Domain-b.com. 17 August 2009. Retrieved 20 August 2009. ^ "India and Russia complete design of new lunar probe". Sputnik News. RIA Novosti. 17 August 2009. Retrieved 20 August 2009. ^ أ ب ت ث ج ح خ د ذ ر "Payloads for Chandrayaan-2 Mission Finalised" (Press release). هيئة أبحاث الفضاء الهندية. 30 August 2010. Retrieved 4 January 2010. ^ أ ب ت ث Ramachandran, R. (22 January 2013). "Chandrayaan-2: India to go it alone". The Hindu. ^ أ ب ت Laxman, Srinivas (6 February 2012). "India's Chandrayaan-2 Moon Mission Likely Delayed After Russian Probe Failure". Asian Scientist. Retrieved 5 April 2012. ^ أ ب "India's next moon mission depends on Russia: ISRO chief". NDTV. Indo-Asian News Service. 9 September 2012. ^ "Chandrayaan-2 would be a lone mission by India without Russian tie-up.". Press Information Bureau, Government of India. 14 August 2013. ^ Clark, Stephen (15 August 2018). "Launch Schedule". Spaceflight Now. Archived from the original on 16 August 2018. ^ "Chandrayaan-2 launch postponed to October: ISRO chief". The Economic Times. Press Trust of India. 23 March 2018. Retrieved 16 August 2018. ^ أ ب ت Kumar, Chethan (12 August 2018). "Isro wants Chandrayaan-2 lander to orbit moon first". The Times of India. Times News Network. Retrieved 15 August 2018. 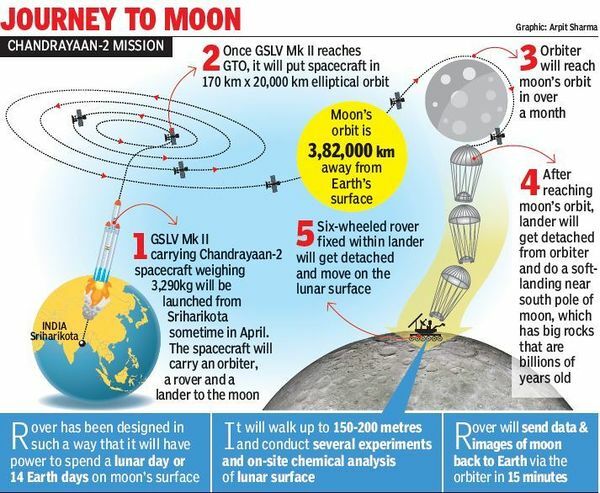 ^ "Soft-landing challenges keep Chandrayaan-2 grounded". The Times of India. 5 August 2018. Retrieved 15 August 2018. ^ "Chandrayaan-2 to be launched in January-March window in 2019, says ISRO". The Indian Express. Press Trust of India. 12 August 2018. Retrieved 15 August 2018. ^ Surendra Singh (2018-02-20). "Chandrayaan-2 mission cheaper than Hollywood film Interstell ..". تايمز أوف إنديا. ^ Singh, Surendra (20 February 2018). "Chandrayaan-2 mission cheaper than Hollywood film Interstellar". The Times of India. Times News Network. Retrieved 3 March 2018. ^ أ ب ت "Annual Report 2014-2015" (PDF). هيئة أبحاث الفضاء الهندية. December 2014. p. 82. ^ أ ب "Chandrayaan-2 to get closer to moon". The Economic Times. Times News Network. 2 September 2010. Archived from the original on 12 August 2011. ^ أ ب ت "Annual Report 2015-2016" (PDF). هيئة أبحاث الفضاء الهندية. December 2015. p. 89. Archived from the original (PDF) on 5 July 2016. 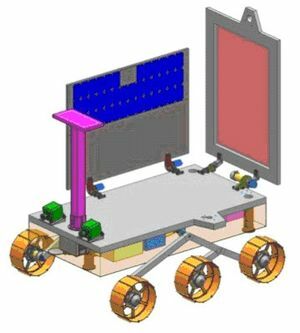 ^ "HAL Delivers the Orbiter Craft Module Structure of Chandrayaan-2 to ISRO". Hindustan Aeronautics Limited. 22 June 2015. Archived from the original on 2 September 2018. ^ Kumar, Chethan (12 August 2018). "Chandrayaan-2 Lander to be named ‘Vikram’ after Sarabhai". The Times of India. Times News Network. Retrieved 15 August 2018. ^ "ISRO developing vehicle to launch small satellites". Frontline (in الإنجليزية). Retrieved 29 August 2018. ^ D. S., Madhumathi (25 October 2016). "ISRO starts landing tests for Chandrayaan-2 mission". The Hindu. Retrieved 28 October 2016. ^ أ ب ت Bagla, Pallava (31 January 2018). "India plans tricky and unprecedented landing near moon’s south pole". Science. Retrieved 8 March 2018. ^ Johnson, T. A. (31 August 2010). "Three new Indian payloads for Chandrayaan 2, decides ISRO". The Indian Express. Retrieved 31 August 2010. ^ Beary, Habib (4 February 2010). "NASA and ESA to partner for Chandrayaan-2". Sakal Times. Retrieved 22 February 2010. ^ Laxman, Srinivas (5 September 2010). "'We're launching Chandrayaan-2 for a total coverage of the moon'". The Times of India. ^ Mallikarjun, Y. (29 May 2013). "India plans to send seismometer to study moonquakes". The Hindu. Retrieved 1 June 2013.